The difference between processes and procedure is quite substantial – a process is more surface-level. It’s used by management to analyze the efficiency of their business. A procedure, on the other hand, is a lot more detailed, as it includes the exact instructions on how the employee is supposed to carry out the job. A process is a series of related tasks or methods that together turn inputs into outputs. A procedure is a prescribed way of undertaking a process or part of a process. Considering the differences between the two terms, it shouldn’t be too surprising that there are different ways to document them. For a process, a simple workflow diagram would do. Procedures, on the other hand, would be explained through a physical or electronic document (To complete the process, do X, Y, and Z). Unlike processes, a procedure doesn’t have to be a workflow – a set of simple guidelines could suffice. A fast food outlet makes hamburgers. The process is a simple one, and it all starts with taking the order. After that, the staff springs into action, cooks the patty, prepares the hamburger roll and serves the finished hamburger up to the client. However, inside this simple process, the fast food outlet’s staff also follow several procedures. Thus, the store owner might specify that the sales assistant should greet the client and smile. He or she may even provide a script for the interaction. That’s a procedure, and it can make a huge difference to a business. Just think of it: even if the sales assistant is rude and unfriendly, he or she has still completed a part of the hamburger-making process the minute the order is written down. Sure, the customer isn’t going to come back, but the sales assistant has still done the job. The “what” criterion has been fulfilled. But if the person behind the counter follows a procedure that indicates the expected standard for customer interactions, the entire customer experience changes. Sure, the task remains the same: the assistant writes the order. However, the customer is happy because the quality of the order-placing experience was so much better. Why Document Processes and Procedures? When you do business, you want to do everything “right.” What’s more, you want your staff to get it right EVERY TIME. As soon as a process that transforms inputs into outputs is repeatable, you have an opportunity to capture the process and procedure so that your staff knows what to do and how to do it. But along the way, you might find that things aren’t going as well as you would like them to. Maybe some variable you didn’t initially plan for enters the equation. Or you discover that there’s room for error in what you thought was a watertight process with sufficient procedural information. Perhaps you just think you’ve found a way to make the process more efficient. You now have an opportunity to revisit the process or procedure that isn’t working well and figure out how to improve it. Did someone make a mistake? Was quality not all you would like it to be? How can you build in a safeguard procedure that ensures it won’t happen again? The real value of capturing every procedure and process is that it allows your business to improve and keep on improving. It’s a competitive world out there, and if you want to outperform your competitors and win greater support for your business, you have to be better at what you do than they are. On the other side of the coin, if they’re doing the same thing you do, only more efficiently or to a higher standard, it’s a real threat to the survival of your business. Continuous improvement is essential to the profitability of your business – and even its survival. It all starts with mapping out what your business does and how it does it. While documenting processes and procedures is one thing, enforcing them is something completely different. You can invest months of your time, come up with a fat file with every process and procedure neatly documented, and guess what? Nobody is going to consult it! So, how do you ensure that processes and procedures get followed? While it’s great for your staff to have an overview of complete processes and procedures to see how they fit into the picture, what really matters is what each person is busy with right now. You can lay out processes and procedures on documents and checklists with complicated cross-references to allow for contingencies. But at the end of the day, how do you know if people followed each step in the way you’ve determined will be best? Do you even have time to collect all those signed off checklists and study them? Business Process Management Software (BPMS) allows the company leadership to keep track of processes and procedures while giving the employee a dashboard with all of their to-dos to complete. And when it’s time to alter process flows and procedural criteria, all it takes is a small tweak. Pages related to - Process vs Procedure: What’s the Difference? Workflow vs Business Process Management – What’s the Difference? 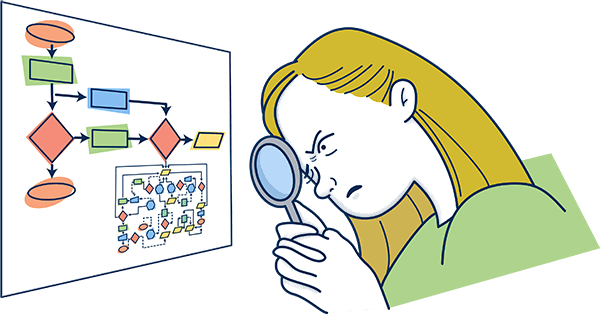 Tallyfy » Blog » Workflows & BPM » Process vs Procedure: What’s the Difference?